Sri Lanka Buddhist Vihara in Canberra will celebrate the Vesak on Saturday, 14 May 2016 from 5.30pm onwards. 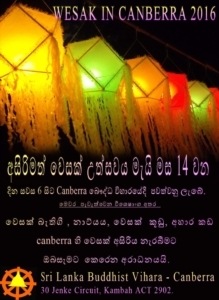 You will also have an opportunity to enjoy Sri Lankan Foods. This is an open invitation to all of you to participate in this event.